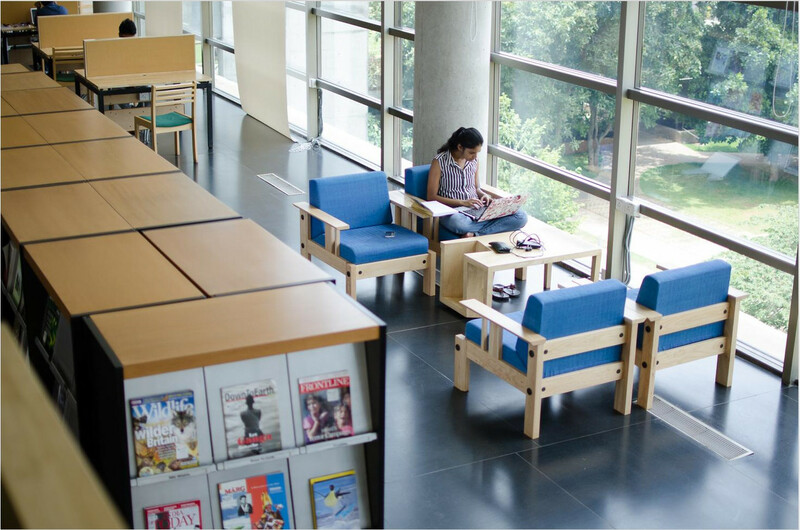 The NCBS library aims at providing access to its printed resources such as books and journals as well as electronic journals and online databases primarily for the use of faculty and staff at NCBS. Its holdings should reflect their interest largely. The library stock is increasing at a rate of approximately 1,000 books a year. The library also subscribes to over 100 current periodicals and to a range of electronic journals and databases. The library is supervised by a committee consisting of the librarian and three members from the faculty. The day to day running of the library is conducted by the librarian who is assisted by the library staff and trainee. The library holdings will be checked annually by the library staff. Any member of NCBS may recommend the purchase of desired or relevant book to the librarian. Books from vendors on approval will be available in the library from time to time. All members are encouraged to peruse the titles in display and make recommendations. Recommendation forms are available at the library counter. Selected new books will be on display and are reserve for a period of two weeks before being available for general circulation. Any member may recommend new journal subscription. The library committee will decide based on input from faculty, available funds and academic need. The readership / use of the journal will be determined through out the year by the library staff and will be used to help to make decisions on subscription. Members may check-out books or journals during working hours and should sign out the items at the library counter. A member may have a maximum of four books and two bound journals checked-out in their name at any time. The books are issued out for a maximum of two week and then they may be renewed if no reservations on the items indicated. Bound journals may be issued out for maximum of two days. If a request for an already issued item is received the librarian may ask for the item to be returned to the library. The minimum period before a return can be requested for books is five days and bound journal is one day. Unbound issues of journals are issued from the library for a maximum of two hours with the permission of the librarian during normal working hours. Any extended borrowing of unbound journals for more than two hours and not exceeding 24 hours will be considered on the merits of each individual case decided upon by the librarian. Books and journals on reserve may not be checked-out. The librarian on instructions from the concerned course instructor may place books and journals on reserve. Fines will be charged on late return of journals and books. The amount that will be charged will be available with the librarian. Amount collected through fines and replacement charges will be used for the library requirements. Books and journals borrowed from the library may not be taken outstation unless special permission is given. The system is activated after working hours and holidays including Saturdays and Sundays. The access control cards will be issued to all the faculty members, post-docs, research scholars individually and to the JRFs with prior permission from the concerned PIs. Getting the cards, individuals have to pay Rs. 150/- as refundable deposit and if the card is lost or damaged Rs. 150/- will be charged as replacement fine. All the entry and exit as reflected in the card will be recorded in the system. Users are requested to use these cards for entry and exit both. These cards are strictly NOT TRANSFERABLE. The security at the reception will be issued with access cards for the use of Administrative, Technical and other staff members as well as for the purpose of emergency and exigencies. The cost of replacement with additional 20% handling fee will be charged to the person for loss or damage to the library materials. Book grants may not be used to settle library dues. Any member if determined to have defaced or damaged any library item intentionally will have his/her library privileges revoked for a period of time determined by the library committee. Library privileges may be revoked permanently for multiple or serious offences. Members must take care of library materials and must not deface them by underlining, writing or drawing in them, by removing any part of them, or in any other way. Newly arrived journals and magazines cannot be issued out of the library before a specified period. The period for "in library use only" will be indicated on the concerned issues / parts and will vary for individual subscription is determined by the librarian from general pattern of use and requirements. All journals, magazines or newspapers subscribed by the library are not be issued before the period specified on the item. Readers may reserve books, bound journals and journals on the tables for up to 3 days by writing their name, the message ("please leave" / "don't disturb") and the date. This date may be changed once if the reserve materials are used, otherwise the reserve materials will be replaced on the shelves after the third day. The reservation of seats is not permitted. The library staff may remove books and other material left unattended for any length of time. This service is available to all NCBS network users. Please note that due to licensing agreements, use is restricted to NCBS IP address only. The computer facilities are provided for academic work only. Users should not use the facilities for non-academic work includes email, web-browsing, etc. Users are not permitted to install any software or programme in any of these PCs. Users are requested not to store / keep any data / files in any of the library computers. There will be no protection for your files / data if they are left on these computers. Please assume that they will be deleted at 17.30 pm everyday. A photocopy machine will be available in the library all the times for use of the faculty and library staff. All other users have to avail the common photocopy facility. Photocopy privileges may be extended in case non-availability of the common photocopy facility and is determined on by the librarian. Inter library loan is a service through which library materials not owned by the NCBS library may be requested from other libraries. The library obtains membership cards / tickets from the Indian Institute of Science (IISc) Library and the British Library for use, these will be distributed by the librarian to users when required. The library staff will ensure that proper use and return of the tickets. If users found to abuse these privileges they will no longer be eligible to use such tickets / cards. External users from other institutions are allowed to use the library on production of library access cards or a letter from their institution. The library access cards will be distributed to the concerned institutions on recommendations from the Dean, NCBS. External users are not permitted to issue out library items. External users may access the photocopy facility for use on an immediate payment basis. Other visitors to the library may use it provided a staff member introduces them to the librarian. The concern staff member is responsible for the visitor. Externals users and visitors are allowed to use the library only during office hours. The permanent staff of the institute can provide a list of members of the family who may be allowed to the library. Family member may be issued library material only through concerned staff. Corporate users may be permitted to use the library facilities on payment / membership fee and authorisation by the Dean, NCBS. During normal working hours the librarian and other library staff will assist the users. They will also assist in obtaining necessary reference material for individual users from other institutions. The library will provide necessary services to obtain personal subscription or book purchases through teaching / book grants for faculty and students. Reprints both personal or for reference can be ordered through the library. The cost incurred for these services are charged to the individual or the grant concerned. 1. No loud conversation or group discussions are allowed in the library. 2. Laptop computer if used in the library must have their own power and cable connector. 3. No food or drink is allowed in the library. 4. Borrowing materials without a valid membership / identity number is prohibited. No one will be permitted to use another member ID no. / name to borrow materials. 5. Do not reshelf books, periodicals, etc. Leave them on the tables properly after use. 6. Please take your personal belongings with you when exiting the library. The library is not responsible for any item left in the library. 7. Do not attempt to install any unauthorised software on the PCs.